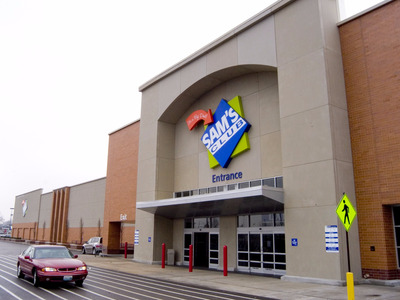 Costco members can now use their Costco cards to shop at Sam’s Club. The deal comes on the heels of Costco’s move to make Visa the card of choice at the retailer, ending a 16-year partnership with American Express. After the change went into effect last week, on June 20, customers flooded Citi with questions about the change and took to social media to complain about difficulties with the switch. Sam’s Club isn’t being subtle about the fact that it hopes to cash in on Costco’s unhappy customers. To add insult to injury, the budget retailer changed its Facebook header to mimic rival Costco’s. While Costco’s header currently reads “Costco + Visa = [heart]”, Sam’s Club’s header reads “Sam’s Club + Choice = [heart]”. Costco has a stricter credit card policy than Sam’s Club. The retailer accepts all Visa cards, Costco credit cards, and debit cards — but, as of last week, not American Express. With the change from AmEx to Visa, Costco customers who earn rewards through a Costco co-branded credit card will need to use the Costco Anywhere Visa — not the TrueEarnings American Express Costco card. This new Costco Visa credit card became the biggest problem in the transition from AmEx to Visa. The most common complaint came from customers who had not received their new Citi Visa card on time. 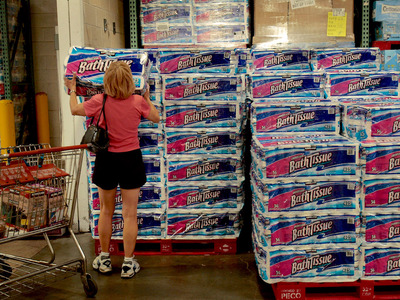 According to a UBS survey of 25 Costco warehouses across the US, 40% of stores reported “a lot” of members had not received their cards, while another 40% reported that “some” members had not received their cards two days after the switch was finalised. Other complaints UBS noticed on Costco’s Facebook page included not being able to use corporate American Express cards, charges being flagged as “fraud,” and the transfer of rewards dollars being lower than expected. These issues were complicated by long wait times and dropped calls while waiting to speak with Citi customer service representatives. With 11 million Costco members making the switch, Citi had a huge customer base to help transition — and, apparently, not enough customer service representatives. According to Citi, call volumes began to return to normal as of Wednesday of last week, meaning that going forward Citi representatives should be more readily available to help Costco members with issues with their credit cards. However, Sam’s Club is banking on the fact that, for some members, the problems they have already faced in the credit card swap will be enough to convince them to give the rival retailer a try. Costco has extraordinarily loyal customers — but, if they can be convinced to visit Sam’s Club once, the competitors may be able to win over at least a few new members in the long term.